The farm – Northern Tynnøl – is a medium sized Norwegian farm. We produce 160 tons of milk and 8 tons of beef every year. At any time there are about 25 dairy cows and 50 other heads of cattle on the farm. We have one cat, Tasse, who is a master in catching mice. From time to time we also have a few hens, lambs or pigs at the farm. Marit and Espen ran the farm from 1997 to 2013, when they took over from Marit’s father. Now Marit run the farm on her own, with a little help from Pawel from Poland. 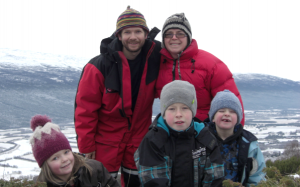 Marit`s parents and the children Trond (b. 1999), Tora (b. 2001) and Svein (b. 2004) live on the farm.